Richmond Hill (2016 population 195,022) is a city in south-central York Region, Ontario, Canada. Part of the Greater Toronto Area, it is the York Region's third most populous municipality and the 28th most populous municipality in Canada. Location of Richmond Hill within York Region. Richmond Hill has seen a population growth since the 1990s. The city is home to the David Dunlap Observatory telescope, the largest in Canada. The village of Richmond Hill was incorporated by a bylaw of the York County Council on June 18, 1872, coming into effect January 1, 1873. In September 1956, the Ontario Municipal Board approved its elevation to Town status, effective January 1, 1957. The Regional Municipality of York was established by Bill 102 An Act to Establish the Regional Municipality of York of the provincial parliament, passed on June 26, 1970 and coming into force on January 1, 1971. The act expanded Richmond Hill's borders, annexing parts of Whitchurch Township, Markham Township, Vaughan Township and King Township into Richmond Hill, expanding the area covered from 1,700 acres (6.9 km2) to 27,000 acres (110 km2) and the population from a little over 19,000 to some 34,000. The town grew to encompass the communities of Gormley, Dollar, Langstaff, Carrville, Headford, Elgin Mills, Jefferson, Bond Lake, Temperanceville, Lake Wilcox, Oak Ridges and Richvale. While Richmond Hill was a prosperous, well developed town, many of the outlying areas annexed were far more rural, with dirt roads, no water mains or sewers and no streetlights, and the time needed to bring municipal services up in these areas, combined with residual unequal tax assessments caused considerable conflict in the municipal politics. Policing was taken over by the York Regional Police, but fire protection remained with Richmond Hill, whose firefighting force quickly grew. Having hired its first full-time employee in 1967, it had fourteen full-time employees by 1971. Yonge Street through Richmond Hill expanded from two lanes to four in 1971, relieving congestion on what was known as "Ontario's worst stretch of highway". The Richmond Hill Dynes Jewellers softball team was the 1972 Softball World Champions. The Royal Canadian Air Farce was recorded at the Curtain Club Theater in Richmond Hill for its first 5 seasons on radio, beginning in 1973. The Air Farce returned for an anniversary recording in the 1990s. Also in 1973 was the centennial of the town's incorporation as a village, and the town set up a number of celebratory activities, including a beard growing contest, commissioning a centennial song, a parade, a street dance and the unveiling of an historic plaque honoring the town's founding in front of the municipal offices. June 27 was officially declared Russell Lynett Day, named after the town's clerk, only the third in its existence. 1973 also saw the sale of the last of the original rose-growing greenhouses in Richmond Hill. Development had led to increasing property taxes and the H.J. Mills greenhouses relocated to Bayview Avenue and Elgin Mill Road. The site of the greenhouses was developed as a subdivision. The fast-growing town set aside significant areas for parks, with five new parks dedicated in 1973, and two more in 1974. The Richmond Hill Historical Society was founded in 1973. The society was dedicated to preserving the history of Richmond Hill and raising awareness of the town's history. Their first action was to restore a 150-year-old house, known as the Burr House. As the 1970s went on, the population growth of Richmond Hill remained large. In 1976, home prices in Richmond Hill were among the highest in Canada. By this time, the town council was split over whether to keep expanding rapidly. The deadlock over a fifty-five house subdivision named Springmills Estate led to one councilor saying that it was not the reform council it was dubbed, but a "deformed council". Other housing projects faced similar problems as councilors debated many things, including the need for affordable housing and the encroachment of homes into the farmland and the Oak Ridges Moraine. GO train service was extended to Richmond Hill in 1978, officially opened on April 29, 1978 by Bill Davis. Growth in Richmond Hill slowed towards the end of the 1970s, with M.L. McConaghy Public School closing in 1979 due to dropping enrollment. At the same time, Richmond Hill began to make official plans for future land development. The first official plan concerned a 700-acre (2.8 km2) industrial park at Leslie Street and Highway 7 named Beaver Creek. A commercial area within the park spread into the hamlet of Dollar. The plan was rejected, however, by the Ontario Municipal Board, and Richmond Hill was the first municipality in Ontario to have its official plan rejected outright by the board. The whole affair was subject to much controversy in the community, although the town council eventually declined to appeal the decision. When the new council convened in 1980, led by new mayor Al Duffy, the town remained without a development plan. The council hired civic planner Peter Walker to produce a new official plan. By September 1981, the new plan was drafted, with limited development of northern Richmond Hill, industrial development centred in the south-east part of town and commercial centres remaining along Yonge Street. The plan was approved in July 1982 by the Ontario Municipal Board. A clash over the use of the land in Langstaff, known as the Langstaff Jail Farm erupted in 1982 between Richmond Hill and Toronto, which owned the land. The 632-acre (2.56 km2) plot of land had been acquired by Toronto in 1911, and was unused in 1982. Toronto's plans for development clashed with those of Richmond Hill over the balance of industry and residential development, with Richmond Hill favouring more industrial development. The rose business left Richmond Hill in June 1982, with the closure of H.J. Mills florists. Mills died in 1980, leaving the company to his son, but the poor economic conditions, combined with increasing property taxes in the growing city made the business unprofitable. A 1984 contest organised by The Liberal had readers submit entries for a new town slogan. The town council chose three of the submissions which residents then voted on, and "A little north, a little nicer" became Richmond Hill's new town slogan. Richmond Hill's explosive growth continued during the 1990s, fueled in significant part by immigration. In the early 90s, Statistics Canada named Richmond Hill as Canada's fastest-growing community. On March 25, 2019, the Richmond Hill Council passed a motion to change the title of Richmond Hill from 'town' to 'city'. The city's motto is En la rose, je fleuris (French for "Like the rose, I flourish"), reflecting either the motto of the Duke of Richmond, or the fact that the city was a centre of rose-growing in the early 20th century. At that time, it was known as the "Rose Capital" of Canada. A more recent motto for Richmond Hill is A little north, a little nicer. Richmond Hill is the only municipal Canadian government to have light pollution laws in place due to the presence of the David Dunlap Observatory. In June 2013, the city's council passed a bylaw to ban the number 4 from new street numbers because it is considered to be bad luck by some Asian cultures. The city is governed by the Richmond Hill City Council, which operates on a Mayor-Council system with six Ward Councillors and two Regional Councillors, plus the Mayor. The council serves a four-year term, after which a new council is elected by qualified electors in Richmond Hill. The council derives its authority primarily from the Municipal Act, 2001 and the amendments of the Municipal Law Amendment Act, 2006. Richmond Hill is a Lower-tier municipality and has the roles and responsibilities of that position. The municipality has a wide purview relating to the interests of the municipality and its residents to develop and maintain policies, practices and procedures through the issuing of bylaws relating to highways, transportation systems apart from highways, waste management, public utilities, culture, parks, recreation and heritage, drainage and flood control, parking, animals, economic development and the licensing of business. The city is also responsible for maintaining its finances in order to provide relevant services and for maintaining an official plan to guide development. Elections for municipal offices are held every four years in conjunction with other municipal elections in Ontario. Elected positions include mayor, regional and local councillors and ward councillors (for six different wards) on the Richmond Hill City Council, as well as trustees for the York Region District School Board, the York Catholic District School Board and for Conseilleres (school trustees) for the Conseil scolaire de district du Centre-Sud-Ouest and Conseil scolaire de district catholique Centre-Sud. The mayor and regional and local councillors also serve on York Regional Council. Richmond Hill Public Library, the Central Library, one of four branches located in Richmond Hill. Richmond Hill has 166 parks, under the Town of Richmond Hill Parks Department in the Recreation & Culture Division, of which most are small urban parks and 544 hectares of undeveloped natural area for recreation. The largest such park is Richmond Green Sports Centre and Park which includes several baseball diamonds, two ice skating rinks, a 300-person amphitheatre and a skateboard park. The City also has a total of 6 public swimming pools, including an indoor wave pool. Each summer, the city features a concert series entitled "Concerts in the Park", each having a specific theme, such as children's music and "The Beach Boys" and are held at Mill Pond Park, with some Sunday concerts at Richmond Green Park. The Richmond Hill Heritage Centre serves as a museum of the city's history. It also runs a variety of programs related to the city's history. The city is also home to the Richmond Hill Country Club, Summit Golf & Country Club, and the Bloomington Downs Golf Course. Richmond Hill was awarded the National Communities in Bloom award in 2003, with a special mention about the city's floral displays. In February 2009, Richmond Hill Centre for the Performing Arts was opened. In September 2009, Alias Grace Park was opened to honor Margaret Atwood's novel's depiction of the city in Upper Canada prior to John A. Macdonald becoming Prime Minister. The 2016 Census recorded a population of 195,022, an increase of 5.1% from 2011. Median age as of 2016 was 42.4, slightly higher than the Ontario median age of 41.3. In 2016, Visible minorities make up 60.0% of the population. According to 2016 Census data, English is the mother tongue of 36.3% of the residents of Richmond Hill. Native speakers of Cantonese make up 11.6% of the city's population, closely trailed by those of Mandarin (11.1%) and Persian (9.8%). Following are Russian (5.0%), Italian (3.2%), and Korean (2.2%). As of 2011, 50.0% of the city's population adheres to Christianity, mostly Catholicism (25.5%). Those who practice non-Christian religions adhere to, in order of size, Islam (11.5%), Judaism (5.5%), Buddhism (2.8%) and Hinduism (2.4%). Those who do not have a religious affiliation account for 26.4% of the population. According to the city's website as of 2011, Richmond Hill is an affluent community with more than 52% of families reporting incomes of greater than $70,000 and over 31% of households reporting incomes greater than $100,000. The average household income in Richmond Hill is $100,900 which is 34% higher than the Canadian average and 26% higher than the provincial average. Based on the 2006 Census, 42.62% of families in the City of Richmond Hill earned over $100,000 and over. The employment rate of the city is 66.36% with the most prevalent occupations being in the business, finance and administration and management sectors. The 2006 Census showed that the unemployment rate is very low at 3.77%, compared with the 7.4% unemployment rate across Canada during the time of the Census. The 1990s and 2000s are a period of strong economic growth for Richmond Hill; In 1999 industrial, commercial and institutional growth was valued at $88.9 million, up from $67.9 million in 1998. The economic growth of 1999 won the city's economic development department three provincial awards from the Economic Developers Council of Ontario. The border between Richmond Hill and Markham is a rapidly growing area for information technology and high-tech industry with over 1,000 such businesses located along their border in 2000. Most businesses in Richmond Hill are small businesses, with more than half of all employers in the city having four workers or less. The city is home to the corporate headquarters of Acklands Grainger Inc., Compugen Inc., Compuware, DMC Mining Services, Lexmark, Rogers Communications, BMW Canada, Science & Medicine Canada, and Staples. The York Region District School Board operates 27 public elementary schools in Richmond Hill, as well as 5 secondary schools: Alexander Mackenzie High School, Bayview Secondary School, Langstaff Secondary School, Richmond Green Secondary School and Richmond Hill High School. Students in schools in the York Region District School Board have scored above the provincial average on the Assessment of Reading, Writing and Mathematics, Primary Division (Grades 1–3) and Junior Division (Grades 4–6) since their introduction in 2002. The board's students in academic math streams have performed above the provincial average on the Grade 9 Assessment of Mathematics every year since its inception in 2002, while those in applied math streams were below the provincial average in 2002-2005, and above the provincial average from 2005-2007. The York Catholic District School Board operates 13 Catholic elementary schools in Richmond Hill. It also operates two Catholic secondary schools, St. Theresa of Lisieux Catholic High School and Jean Vanier Catholic High School. There are also four private primary schools located in Richmond Hill and five private secondary schools, including Holy Trinity School, Richmond Hill Christian Academy, Discovery Academy, Toronto Montessori Schools, and Richmond Hill Montessori & Private Elementary School. Post-secondary education services are provided to the residents of Richmond Hill by several post-secondary educational institutions in Toronto, some of which have satellite campuses in nearby communities. Former Governor General Michaëlle Jean was a guest at the opening ceremony of a school named after her, in 2008, the Michaëlle Jean Public School. Oak Ridges is an unincorporated community to the north of Richmond Hill's downtown and south of Aurora. It has fallen within the limits of Richmond Hill ever since its annexation in 1971. It is largely residential, with most commercial development located along Yonge Street. 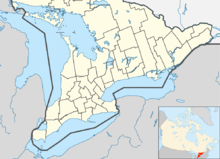 Located about 16.5 km north of Toronto and has a population of approximately 20,000 people. The city developed around Lake Wilcox, the largest lake in the area and a community within Oak Ridges, and has continued to expand slowly since its annexation. In the 1990s, Oak Ridges experienced moderate growth, which has spurred environmental action and anti-development movements by numerous organizations. Population has grown significantly as a result of development initiatives along Bayview Avenue. The Oak Ridges Community Center was built and completed in June 2012 to accommodate community demand. Southern Richmond Hill is home to the city's industrial and business region housing most of the city's hotels, as well as the main commercial area of the city's Chinese community. The northern part of city is considered to be Old Richmond Hill as it is a historical area. Central Richmond Hill is a very commercial area, housing multiple malls, plazas and entertainment buildings, such as theatres and restaurants. The northernmost part of the city is mostly farm land, though it is slowly being developed. During the 1990s, Chinese immigrants primarily from Hong Kong moved to Richmond Hill, where they set up businesses and shops catering to the community. Many shops and restaurants were established in suburban-style shopping malls and plazas, such as Times Square, along a stretch of Highway 7 between Bayview Avenue and Leslie Street. Mill Pond is a park located in the mid-region of Richmond Hill that is surrounded by heritage homes. The old downtown Richmond Hill (also known as the historic Village of Richmond Hill) is considered the strip of Yonge Street between Major Mackenzie in the south and Richmond Heights in the north. The new theatre was opened in 2009 and provides a modern venue for live performances. The Bayview Hill is a subdivision located on the northeast side of Bayview Avenue and 16th Avenue. Built in the early 1990s, the subdivision contains large expansive homes. Richmond Hill's current commercial hub is located near Leslie Street and Ontario Highway 7, where it borders Markham's AMD headquarters. Built in the early to mid-1990s, the area is serviced by Highway 404, York Region Transit, and Buttonville Airport. The current City Hall was moved to that location in 1994. Jefferson is a newly developed neighbourhood, with housing begin to occupy in 2007. The community is named after Jefferson Sideroad, a major thoroughfare in the neighbourhood. Jefferson includes a large area, roughly bounded by Gamble Road in the south, Bathurst Street in the west and Bayview Avenue in the east. The community includes a residential subdivision namely Jefferson Forest, located in the southeast portion of the community. The city of Richmond Hill is well serviced in terms of transportation facilities for a community of its size. The eastern border of the city is Highway 404, a major highway which leads directly into the downcity core of the City of Toronto via the Don Valley Parkway (DVP). Highway 404 also intersects with Highway 401 in North York, which is one of the most traversed highways on the planet and is the principal east/west route in the Greater Toronto Area (GTA). The city's southern border is defined by the former Highway 7 and a parallel expressway, Highway 407. The latter is a toll route and was designed as a bypass for the 401. The combined effect of these highways ensures that Richmond Hill is well integrated into Ontario's road network and has easy access for all road vehicles. The ease of accessing the city is threatened by increasing traffic due to growth in the region, as the resulting commutes diminish the usefulness of the road network. Public transit within the city of Richmond Hill is on buses co-ordinated by York Region Transit (YRT). In September 2005, YRT unveiled a new rapid transit initiative entitled VIVA which provides enhanced bus service on major routes using vehicles capable of speeding up traffic lights to lessen the time they idle. YRT also operates several feeder routes on secondary streets in the city. Commuter train service is provided to the city by GO Transit on the Richmond Hill line with two stations in the city, Richmond Hill Station and Langstaff Station. Langstaff Station is near the new Richmond Hill Centre Terminal of York Region Transit at Highway 7 and Yonge Street, and is connected to it by a pedestrian bridge opened in March 2008. The Richmond Hill Centre Terminal is complete with enclosed heating areas, payphones, and credit card/debit card ticket purchasing machines. Owing to its proximity to Toronto, there are plans to extend the TTC subway system to the intersection of Yonge and Highway 7. A timeline has not been established. Richmond Hill is minimally serviced by other modes of transportation. Its landlocked situation inhibits any water transportation and it lacks an airport of its own, though it does border on Markham's Buttonville Airport. The closest international airport is Pearson International Airport. Richmond Hill is bounded by Bloomington Rd. (Aurora town limit) to the north, York Regional Road 7 (Vaughan city limit west of Yonge St., Markham city limit east of Yonge St.) to the south, Bathurst St. (Vaughan city limit) to the west, and Ontario Highway 404 (Markham city limit) to the east. Its southern limit is about 4 kilometres (3 miles) north of the Toronto city limit, Steeles Avenue, and approximately 20 kilometres (12 miles) north of the downtown core of Toronto. The city extends 14 kilometres (9 miles) north-south and 7 kilometres (3.5 miles) east-west. The predominant feature of the city's geography, as its name suggests, is its elevation above surrounding regions. Thousands of years ago during the last ice-age, glaciers moving in a southerly direction amassed a considerable amount of earth in front of them which they carried forward as they grew. Gradually, as the temperature increased the growth of the glaciers lessened and eventually they began to recede to what is now the polar ice cap. The earth that had been collected by the glacier's movement however was left in place and the elevated region that remained comprises modern day Richmond Hill. The city itself is at a much greater elevation than other communities within the Greater Toronto Area (GTA) and with exclusion of areas closely alongside its borders, the constituent of York region with the greatest height above sea level. The uneven melting of the glacier that formed the city has led to an extremely varied geography within the city's own borders, leading to such features as kettle lakes, minor tributaries and most notably the Oak Ridges Moraine. Kettle lakes are the result of glacier water getting caught in water-tight depressions in the land and are sustained by only rainfall in the immediate area. The City of Richmond Hill has many of these water bodies and its three largest in order of decreasing size are Lake Wilcox, Bond Lake and Philips Lake. The kettle lakes are predominantly confined to the northern fringes of the city. Being elevated above the surrounding region, precipitation in the city tends to flow outwards via the multitude of streams and rivers that flow through the city. Principally water flow is in one of two directions, south to Lake Ontario or north to Lake Simcoe where they join up with larger tributaries that feed into the water bodies. Of note, are the Rouge, Humber, and Don rivers which receive some of their flow from sources in the city. Perhaps the most important geographical feature of the City of Richmond Hill is the Oak Ridges Moraine. The moraine is a further elevated region of loose soil which comprises a significant portion (roughly the northern third) of the land area of the city. Its porous nature allows the collection and natural filtering of waters that flow through it which are then fed into multiple underground aquifers. While the city receives its water from the City of Toronto, these aquifers are an important source for those with their own wells in addition to surrounding communities. The ability of the soil to hold so much water means that despite Richmond Hill's comparatively high elevation, it has a very high water table which poses some problems to construction. The moraine is also host to a staggering amount of biodiversity and in recent years there has been a considerable amount of pressure applied to government to shield the area from development. Consequently, a considerable portion of Richmond Hill is subject to the Ontario Government's Greenbelt legislation. Hillcrest Mall is a large and popular shopping mall located in the city of Richmond Hill, Ontario, Canada, on the northwest corner of Yonge Street and Carrville Road. It has 135 shops, services, and restaurants. The Emerald Isle motel on Yonge Street is known to display conservative rhymes and provocative quotes on their sign. These quotes usually relate to current events. The film, Man of the Year, starring Robin Williams was filmed at Emerald Isle Motel in late 2005. This motel also was featured in the film The Wrong Guy. The David Dunlap Observatory is home to the largest reflecting telescope in Canada. The 74-inch (1,900 mm) telescope was the second largest in the world upon its construction in 1935. The observatory was a research facility of the University of Toronto. The original Canadian burger chain Harvey's restaurant was opened in Richmond Hill in 1959 at the corner of Yonge Street and Observatory Lane. It was demolished in February 2012 and was replaced by the Xpression condominiums. The City of Richmond Hill Municipal Office Building is located at 225 East Beaver Creek Road. The building serves as the seat of government of the municipality. Most of the city departments are located in said location. All public Council and Committee Meetings are also held in this building. The Richmond Hill Centre for the Performing Arts, located in downtown Richmond Hill. Richmond Hill is sister cities with Lakeland, Florida, and twinned with Netanya, Israel and Shijiazhuang, China. ^ a b "2018 Richmond Hill OFFICIAL Municipal Elections Results". Town of Richmond Hill. Retrieved 2018-11-14. ^ a b c d e f Canada, Government of Canada, Statistics (February 8, 2017). "Richmond Hill, Town [Census subdivision], Ontario and York, Regional municipality [Census division], Ontario". www12.statcan.gc.ca. Retrieved March 21, 2017. ^ "Incorporation of Richmond Hill". County Council. The Globe. June 19, 1872. ^ Robert M. Stamp (1991). "First Peoples on the Land". Early Days in Richmond Hill - A History of the Community to 1930. Richmond Hill Public Library Board. ; see also Archaeological Services, Inc., "Town of Richmond Hill Official Plan: Archaeological and First Nations Policy Study," October 2009; "The Stage 4 Salvage Excavation of the Orion Site," Dec. 2008. ^ "Incorporation Document". The Liberal. Richmond Hill. September 20, 1956. p. 1. ^ a b c d e f Marney Beck Robinson and Joan M. Clark (2000). The Challenging Seventies. Later Days in Richmond Hill - A History of the Community from 1930 to 1999. Town of Richmond Hill/Richmond Hill Public Library Board. ISBN 0-9695376-1-1. ^ "History of Air Farce". Air Farce Productions Inc.
^ Richard Furness (May 1, 1978). "Burgers outdraw Davis at GO train inaugural". The Globe and Mail. p. 4. ISSN 0319-0714. ^ a b Marney Beck Robinson and Joan M. Clark (2000). The Dream Years. Later Days in Richmond Hill - A History of the Community from 1930 to 1999. Town of Richmond Hill/Richmond Hill Public Library Board. ISBN 0-9695376-1-1. ^ "It's the neighbour again". The Globe and Mail. April 2, 1982. p. 6. ^ Zuhair Kashmeri (April 1, 1982). "Toronto after fast buck, Richmond Hill protests". The Globe and Mail. p. 3. ^ Marney Beck Robinson and Joan M. Clark (2000). Growing Success. Later Days in Richmond Hill - A History of the Community from 1930 to 1999. Town of Richmond Hill/Richmond Hill Public Library Board. ISBN 0-9695376-1-1. ^ Wang, sheila (26 March 2019). "Richmond Hill changes status from town to city". Richmond Hill Liberal. Retrieved 13 April 2019. ^ "No. 4 banned from new Richmond Hill, Ont., street addresses". CBC News. June 4, 2013. Retrieved 9 June 2013. ^ "Municipal Councillor's Guide". Ministry of Municipal Affairs and Housing Municipal Services Offices (Ontario). ^ "Parks A-Z". Town of Richmond Hill. Retrieved 2008-02-21. ^ "Richmond Green Sports Centre & Park". Town of Richmond Hill. Retrieved 2008-02-21. ^ "Concerts in the Park". www.richmondhill.ca. Retrieved 2017-02-12. ^ "The Richmond Hill Heritage Centre". Town of Richmond Hill. ^ "Richmond Hill Curling Club". ^ "Immigration and Ethnocultural Diversity Highlight Tables". Statistics Canada. ^ Robert M. Stamp (1991). "The First Village Council". Fire Brigades and Fence Viewers. Town of Richmond Hill Public Library. ^ Robert M. Stamp (1991). "Roses Bloom in Richmond Hill". The Flowering of Richmond Hill. Town of Richmond Hill Public Library. ^ "York Region Population Growth 1971 to 2006". York Region. ^ "Community Profile - Richmond Hill". Statistics Canada. ^ "Community Highlights for Richmond Hill". 2001 Community Profiles. Statistics Canada. January 2, 2007. ^ "Community highlights for Richmond Hill". 2006 Community Profiles. Statistics Canada. 2007-03-13. Retrieved 2007-03-13. ^ "Focus on Geography Series, 2011 Census – Census subdivision of Richmond Hill, T - Ontario". Statistics Canada. Retrieved 2012-12-14. ^ a b "Demographics & Statistics". Richmond Hill Office of Economic Development. ^ "Census Profile". Statistics Canada. Retrieved 2017-02-22. ^ "Richmond Hill, Ontario (Town)". 2011 Community Profiles. Statistics Canada. ^ a b "Richmond Hill Demographic Profile 2006" (PDF). Archived from the original (PDF) on 2007-09-27. ^ Leslie Ferenc (April 5, 1999). "Richmond Hill reports a banner growth year ; All areas of economy break records". Toronto Star. p. 1. ^ Peter Boisseau (August 16, 2000). "High-tech thrives around Toronto: Richmond Hill, Markham part of fastest-growing hub Series: Canada's High-Tech Landscape". Edmonton Journal. pp. G.7. ^ "Socio-Economic Study for the Town of Richmond Hill" (PDF). March 2008. ^ "Our Schools". York Region District School Board. Retrieved 2016-07-20. ^ Marguerite Jackson (September 19, 2007). "School Board Report York Region DSB (66095)". Education Quality and Accountability Office. ^ "Secondary schools" (PDF). York Catholic District School Board. 2009-07-29. Retrieved 2008-02-20. ^ "Labour Market". Richmond Hill Office of Economic Development. ^ "Oak Ridges Community Centre & Park". Retrieved 28 August 2012. ^ "Village of Richmond Hill". Village of Richmond Hill Business Improvement Area. ^ "TTC: Yonge Subway Extension". ^ "Richmond Hill, Ontario". 1981–2010 Canadian Climate Normals. Environment Canada. Retrieved 2015-02-16. ^ Zarzour, Kim. "Richmond Hill twins with Israeli city of Netanya". YorkRegion.com. Metroland Media Group. Retrieved 4 December 2016. Wikivoyage has a travel guide for Richmond Hill. Wikimedia Commons has media related to Richmond Hill, Ontario. Stamp, Robert M. (1991). "Early Days in Richmond Hill: A History of the Community to 1930". Richmond Hill Public Library Board.